This fall/winter season as you look around you at the many things to be grateful for, who can wish to NOT extend that gratitude out to others? There are so many who are less fortunate than ourselves. The gratitude we feel tugs on our heart strings, asking us if there’s some small thing we can do for others. This has become a universal feeling that can help your fundraising efforts to spread good cheer. The need could be met at the homeless shelter downtown where hygiene kits – and even teeth whitening kits – are amongst the most well-received gift. It’s almost impossible for hygiene to stay at a high level when someone is on the move, not knowing where their next bed will be for the night. But having a toothbrush, dental floss and toothpaste could in fact save someone from heart disease by removing bacteria from the teeth that head straight for the heart and blood vessels, scientists report. Another reason why the homeless are thrilled with a hygiene kit is that they often worry about their appearance on the day of a long-awaited job interview. Yet, inside the kit you provided was Tresemme shampoo and conditioner with its great aroma, hair spray, deodorant and of course toothpaste, toothbrush, floss and a disposable razor. It’s all the essentials for making that good impression before a potential employer, who can open doors to the person and help get them off the street. You could also choose to change the ingredients of the kit to the Women’s Deluxe 10-piece Herbal Essences Travel Kit (Herbal Essences Shampoo & Conditioner, Eucerin lotion, Secret A/P Deodorant, Crest toothpaste, toothbrush, Dentek flossers, styling comb, and quart size zip top bag that becomes a cosmetic travel bag ($42/4 kits). 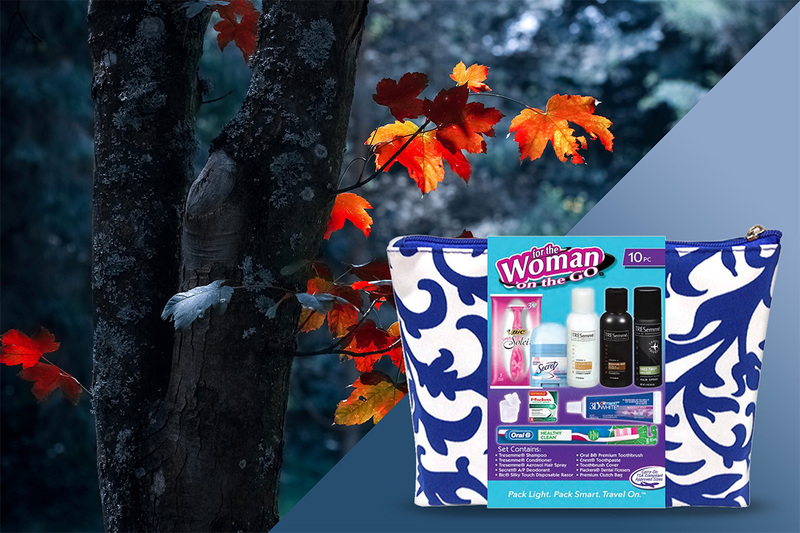 And if you prefer Pantene shampoo and conditioner instead of Herbal Essences or Tresemme, then there’s another hygiene kit that’s available to choose from – the Women’s 10piece Travel Kit ($43.50/6 kits). Or even swapping out the shampoo and conditioner for the Fructis brand and adding some shaving cream, a cotton swab vanity pack, nail file, shower comb and two-way folding mirror for $53.70/8 kits is another option. If you have a heart for women during that ‘time of the month’, providing a Women’s Deluxe Feminine Hygiene Emergency Kit for them that contains 2 tampons, 2 maxi pads, 2 Advil caplets, and 2-feminine hygiene moist wipes in a vinyl pink zippered bag with a handle strap ($40.80/12 kits) will rescue a dozen women during those rough times. As you can see, these are noble goals – and ones you probably end up receiving a reward for in the afterlife. And that’s why these hygiene kits and travel kits are excellent for your church group to use for a fundraiser. It’s not a hard sell when you stand before the church congregation and explain these simple facts that were previously stated. For an investment of $33.30 for the Woman’s Premium Travel Kit – the cost of a week’s worth of Starbuck’s high caffeine high sugar drinks – in order to help directly improve the lives of three women is truly a no-brainer for the average churchgoer. There are travel kits suitable for moms – A 10-piece Johnson & Johnson Baby Travel Bag (baby powder, shampoo, lotion, rubber duck, brush, comb, rattle and bath guide booklet - $46.50/6 kits) or those about ready to enter the hospital such as women undergoing cancer treatment, ready to give birth, or going in for a repeat procedure. Or you might have a business group that sees the demise of the American male in society and is faced with high unemployment rates. They can be reached via different organizations that directly train men for new jobs – and a Man on the Go 10 piece Premium Travel kit is that extra little boost they need in confidence for that new job interview and first week of worth. Receiving such a gift that occurs essentially out of the blue is like a supernatural hand of God coming out of the heavens and helping them. Yes, it’s true that the men in this category may not be traveling on a plane but it’s still suited for them because it plants a seed that he WILL be traveling soon. And it’s only $7 per kit starting price, which decreases the more kits you purchase. This type of kit is well suited for travelers because it meets all specs for carrying all items onboard. The TSA trashcans at the airport won’t contain any items from this travel kit. The travel kits and hygiene kits are absolutely perfect for gifts for those who are both in your inner circle as an extra gift. But they’re also great for those in your outer circle of friends that deserve an individualized gift for the holiday such as colleagues at work, members of the choral group you belong to, the neighbors you love, and the people who are in service jobs that service you (UPS man, mailman, dentist, doctor, cashier at the bank, etc.). Even businesses getting ready to put on an annual holiday party would welcome travel and hygiene kits to distribute to their employees in addition to the annual turkey or ham. Everyone can benefit from a travel kit and it’s usefulness will never expire.